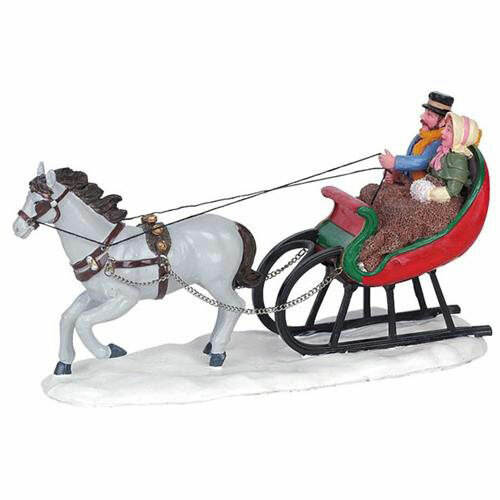 Lemax Sleigh Ride Table Accent depicts a Victorian couple wrapped up warm enjoying a fun ride through the snow pulled by a horse drawn sleigh! Lemax Sleigh Ride is suitably placed in and amongst a seasonal Lemax village miniature Winter scene. A Lemax Caddington Village themed collectable piece which joined the Lemax collection in 2009. Sleigh Ride offers a delightful individual hand painted polyresin piece including multi figurines on a snowed base to compliment your seasonal Lemax Christmas Village.